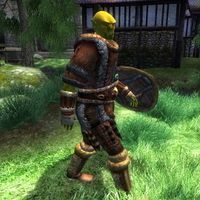 Burz gro-Khash is an Orc barbarian and the head of the Cheydinhal Fighters Guild. He's one of the first people you will report to for many of the quests. He's not particularly impressed with the two Guardian rank fighters residing in the Cheydinhal guildhall, and spends most of his time alone without talking too much with anyone. He sleeps in the upstairs area every night between midnight and 6am. After waking up and as long as it is not raining, he immediately exits the house and heads for the small island between the two bridges and enjoys the sunrise and silence for four hours. If it is raining, he will choose to remain inside the guildhall and simply wander around. At 10am he heads back to the guildhall and wanders around there all day, only interrupted by a brief visit into the basement at 2pm. At 6pm he picks up some food and enjoys a two-hour dinner. The rest of the evening is spent drifting sleepily around in the upstairs area before he goes to bed at midnight. He wears a complete set of enchanted fur armor (Boots of the Cheetah, Cuirass of the Bear, Gauntlets of the Horker, Greaves of the Cat, and Tiger Fang Shield), and carries around a leveled glass mace, which has the distinction of being the only non-enchanted leveled weapon in the game. He also carries a burgundy linen shirt, burgundy linens, and a pair of thick cowhide shoes that he will change into when he goes to bed and a small amount of gold. Burz may randomly use one of two lines of dialogue to greet you the first time you meet him. One makes reference to Jiub from Morrowind: "I'm Burz gro-Khash, and I'm in charge of this St. Jiub's Fair. All I need is clowns, monkeys, and jugglers. No. Wait... just need jugglers...." The other is more serious: "Yeah. This is the Cheydinhal Fighter's Guild. Look around. See any fighters? Right. That's the problem. No fighters, no guild." When you ask him about Cheydinhal, he will give his complaints about fellow guildmembers: "This guild is going to hell in a hogcart. Look at what they give me? Keld of the Isles? Ohtimbar? Both Guardian rank? Phah! Useless." When you meet Burz for the first time and ask him about the Fighters Guild, his spoken comment does not match the subtitles. They present you with the common Fighters Guild response: "I love being in the guild. There's money to be made. If you'd like to join up, let me know." In the spoken dialogue, Burz will mistakenly point you towards Vilena Donton for guild membership, even if he is able to let you join himself: "I love being in the guild. There's money to be made. If you're interested, find Vilena Donton in Chorrol." Similar to his companion Keld of the Isles, Burz was supposed to have a sparring session from 2pm to 6pm. However, the package is erroneously set as a "Find" type instead of a "Use Item" type. This causes him to simply take a short trip to the basement and then simply stroll around the guildhall. This page was last modified on 26 December 2017, at 23:26.